You know, we're starting to think that the only things that would survive a nuclear holocaust would be cockroaches, Kevin Federline and Matt Millen. And at least the cockroaches would feel kind of guilty about it. In an interview yesterday about the upcoming NFL Draft, the indestructible Lions general manager thought it would be funny to mock the hopes and dreams of Detroit fans, dreams he has personally eradicated. "I am a wide receiver expert," joked Millen, who spoke to a small group of reporters in the lobby of the Westin Hotel in downtown Indianapolis on the eve of today's NFL combine. 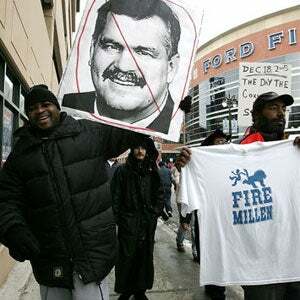 Millen was then asked if the Lions would avoid taking Johnson because they had picked receivers Charles Rogers (Michigan State), Roy Williams and Mike Williams with their first pick for three straight years. "I don't know if you've noticed this, but we haven't really looked at what people have said we should do too often," he said.